Here’s our first delivery of vegetables from the organic farm we subscribed to this year. Aren’t they beautiful? Farmer Renee dropped them off today at a church behind our local Starbucks. 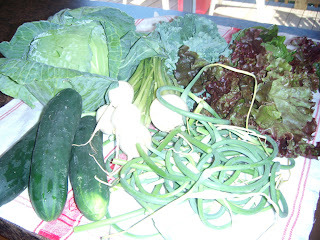 What I'm able to identify is the red-leafed lettuce, the bunch of turnips (in the center of the photo), and the cucumbers. I can’t competently i.d. the other two lettuce varieties. The bag of what we first thought were green beans turned out to be long, curvy green onions (not like any I’d ever seen before). We chopped off a piece to taste. Wow—so fresh. The challenge, of course, is how to prepare all this lovely produce during the next seven days (before the next delivery). And to get our daughters to partake! Wrong on the onions. According to Farmer Renee, they are garlic snapes. Anyway, they're delicious.